Add a colorful skin to your apple watch! This ultra-thin and lightweight case is like a skin, coloring your apple watch and giving it a good protection at the same time. Soft and smooth TPU material brings you with comfy, even in sports. Shiny or transparent style looks luxury and exquisite. Plug your apple watch in, better with the band off. It will fit your apple watch closely and provide easy access to all Apple watch features without removing the case. Easy to put the cover on and off. What's more? Here are several colors and packs available. Black, silver, rose gold, gold, transparent and so on. This product is sold exclusively by MAIRUIJIA. Only buy from MAIRUIJIA to get genuine MAIRUI products with Quality warranty and super customer service.MAIRUI is registered trademark of MAIRUIJIA and is exclusively distributed by MAIRUIJIA on Amazon. MAIRUI trademark is protected by US Trademark Law. Universal Compatibility-The apple watch cover perfectly works with apple watch series 3 2 1, iwatch Sport/Edition/Nike+. Easy installation-Plug your apple watch in, the cover works like a skin to protect it well. Easy to put it on and off. Access to all controls, buttons, sensors and Apple watch features. 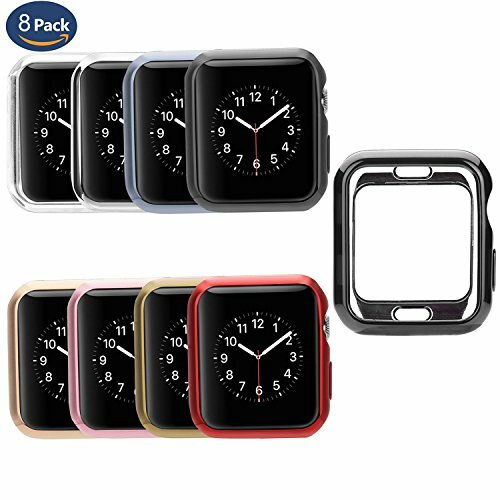 Superior Quality-The apple watch protector is made of premium tpu material, durable and reliable; soft and smooth; ultra-slim and lightweight. Delicate Appearance-Shiny luxury apple watch cover in simple style shows elegance and nobility. Perfect for business, ceremony, party and daily use. A lot of colors available, like black, silver, rose gold, gold and transparent.